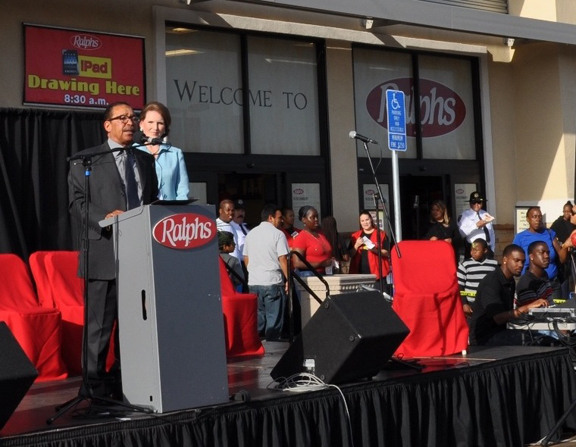 Following a major remodeling, Council President Herb Wesson was on hand to launch the celebration of the re-opening of the Ralphs Baldwin Hills Supermarket. Also attending the celebration was Congresswoman Maxine Waters and over 200 community residents. The $18 million in renovations included a 21,000 square-foot expansion, bringing the total size of the market to 60,000 square feet. The major remodeling will accommodate a wider range of fresh, organic and natural meats, produce and seafood. Based upon shopper’s requests and input, the remodeled and expanded store offers a full range of products and services, including a bakery with freshly baked breads and desserts, a full-service delicatessen and a floral department with blooming fresh flowers and plants. The store will be served by a free shuttle that will run throughout the neighborhood, to and from the store on a regular basis. The remodeled Baldwin Hills store employs approximately 150 full-time and part-time associates, including more than 40 newly hired associates from the surrounding community. The celebration also included Ralphs’ presentation of a special donation of $7,500 to be shared by Dorsey High School, Audubon Middle School, and Baldwin Hills Elementary School.